My favorite set of sock needles snapped (which is what happens when you sit on them, bend them, and then bend them back a few too many times) so I’m waiting for a new set to arrive and while I wait I’m keeping busy knitting up a sweater for me and a shawl that I had shoved away because I was annoyed with it. I’m no longer annoyed and in fact have modified it some and really like how it’s turning out. Because I’ve been trying not to watch hours upon hours of television each day (don’t ask me how that’s going) I decided to start watching knitting podcasts because that’s completely different and I’m absolutely loving them. I’m slightly tempted to try one myself. Maybe. If I don’t get completely weirded out by the idea of me talking in a room by myself to the computer. Anyway, for those of you knitters out there…I thought I’d share some of my favorites. If you have one not on my list, I hope you’ll share it. And despite my plan to give up the television, I’ve been watching two shows. (I blame my friend, Kristi.) Orphan Black and Ray Donovan. I’m only three episodes into the first season of Orphan Black because it’s ridiculously intense and I can’t watch more than one at a time. I started the second season of Ray Donovan but I’m not feeling it as much as I was in season one. I think the whole bad guy with the heart of gold thing just isn’t holding up for me. I’ve also been doing some reading, not as much as I should, but I can’t knit and read at the same time. I should probably just do a separate post but I’ll mention a couple of them. I finally read another off my list of books to read in 2014. I really wanted to like “I am Malala” because I think she as a person is amazing, but I really had a hard time with the book. It seemed disjointed and was hard for me to follow. Of the others, the two I five-starred are “It’s Kind of a Funny Story” and “Ender’s Game”. Sci-fi/fantasy was NOT my thing when I was younger (and I’m still kind of “eh” about it all) but I really did enjoy this one. “It’s Kind of a Funny Story” is about mental illness and the timing of when I finished sucked and it just hit me kind of hard. I think I need some light reading now so I ordered “Prep” by Curtis Sittenfeld. I enjoyed her “American Wife” and my friend told me she had read Prep and enjoyed it, so that’s next on my list. Any good (light) books you can recommend? And in garden experiment news: I ended up with five radishes and one full grown green bean (I have lots of baby beans so hopefully they grow up) and a ridiculous amount of weeds. We didn’t stake things out so I didn’t even touch the garden for about three weeks because I didn’t want to pull anything that might be a plant and now the weeds are crazed. And I accidentally weeded out my onions because they got added in willy-nilly so I didn’t know what they were until it was too late. Eh, the radishes and green bean tasted delicious, so I’m calling it a win. And we’ll do better next year. So that’s us. Happy Tuesday! I’d love to figure out how to knit and read simultaneously! I haven’t watched any knitting channels at all, so don’t have any to contribute to your list, but I do follow a couple of knitting blogs, and these two women (the yarn harlot and knitting to keep sane) seem to be able to knit just about anywhere (in movie theatres, even) which makes me now wonder if it wouldn’t be possible to knit something VERY straightforward (I’m thinking garter stitch dishcloths!) while reading? 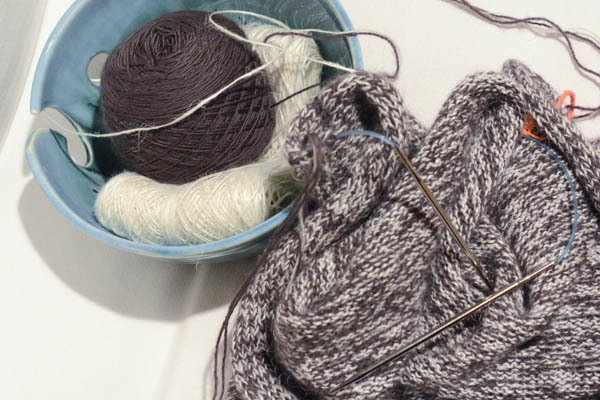 I often feel the pull of both things — knitting and reading — in the evenings. Which to do? Lately, I’ve been reading quite a lot. I’m currently reading All the Light We Cannot See (I don’t know if you remember, but we had had a bit of discussion about that book here). I had reserved it months ago at the library, but had forgotten that I had done that. /Rolls eyes/ Anyway, my turn came up and now I’m trying to speed my way through it as I only have two weeks with it. (And I’m LOVING it!). A book I read last year and absolutely LOVED was The Signature of All Things. I don’t think I would necessarily classify it as a “light” read — it’s quite long and detailed (but I thought the detail was wonderful,and the writing just completely pulled me in) — but it wasn’t what I would term a “heavy” read either (I tend to think “heavy” reads are those books which are current and which add to my worries, rather than books which take me out of my own life and my worries; because this book is set in the 1800s, and was just (in my mind anyway) a really good story, it completely immersed me and provided much needed escape). Ah, gardens…we’re in the same boat, Kate! I’ve got an unbelievable amount of weeds in my veggie patch, and the kale is being decimated by green worms, and I seem to be making every excuse in the book for NOT getting out there to pick them off! I LOVE Stephanie of the Yarn Harlot! That last blanket she knit absolutely blew me away. She has a great blog! I haven’t head of knitting to keep sane, so I’ll have to check that one out! Thank you! I agree with you that light doesn’t always need to be “light” but a good story that can take you out of your own head and worries. I won’t say that I don’t have a fondness for some fluff (what’s the point of having an e-reader if you can’t read some good bodice rippers without having to hide the cover?!? ), but I love a good story. I’d like to hear what you think about All the Light We Cannot See when you finish! I think the writing is amazing but I still just feel kind of “eh” about how it all ends.